On Sol 50 (Sept. 26), Curiosity completed its longest drive yet, rolling about 160 feet (48.9 meters) eastward toward the Glenelg area. The mission's total distance driven has now reached one-quarter mile (416 meters). A priority in coming sols is to identify a location for first use of the rover's capability to scoop up soil material and deliver a sample of it into laboratory instruments. Activities on Sol 50 included pre-drive imaging of a target near the morning location and post-drive imaging of the new surroundings and the sky. 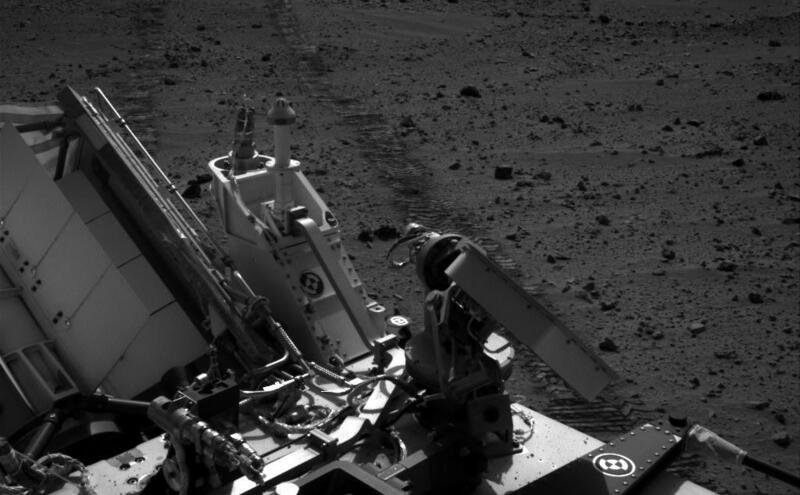 A raw image from Curiosity's left Navigation Camera, with tracks from the drive in view, is at http://1.usa.gov/SzZmHE. Curiosity continues to work in good health. Sol 50, in Mars local mean solar time at Gale Crater, ends at 4:29 p.m. Sept. 25, PDT (7:29 p.m. EDT).